This article on marine insurance in Spain (more commonly known as boat insurance) is designed to help you get the lowest and cheapest quote for your water-based vessel such as yachts, power boats, motor-cruisers, windsurfers, dinghys and jet-skis. While we are sure that you are obviously looking for the cheapest insurance that you can find, you should be thorough and check the small print of the policy. There is no point having insurance and then finding out when it comes to claiming, that your coverage is not adequate. Go to a Spanish broker who will get a number of different quotations on your behalf and then compare them to give you the cheapest possible price as well as more expensive options which may be more suitable for your circumstances. The legal/privacy bit we have to put in – Note that you are using this form to submit your details to us so we can then compare the market and give you options for marine insurance. Our privacy notice at the footer of our website lets you know how we use your data and how to request removal. You don’t need to do anything other than fill in your details and let our brokers do the rest. 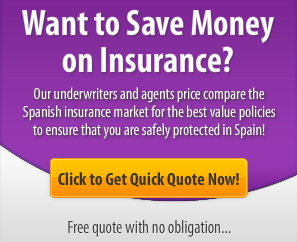 Who Offers Marine & Boat Insurance in Spain? Use a price comparison website which will take your specifications and instantly search online and compare prices for the cheapest boat insurance. Do take into consideration your language skills. If you are not fluent in Spanish then it is important to take out marine insurance with policy documents issued in English. Many expats who live in Spain will have moved to one of the Costas (coasts) to enjoy the benefits of the sunshine and living close to the beaches and the sea. Most expats looking for marine insurance or boat insurance will be on the Costa del Sol (especially Marbella, Puerto Banus, Benalmadena, Fuengirola, Torremolinos, Nerja & Malaga). The Costa Blanca is also a popular area in which to own a boat as there are many marinas here (especially Alicante, Benidorm, Calpe, Moraira, Torrevieja). Other popular areas for sailing and boating include the Costa Brava or the islands of Spain such as Tenerife, Lanzarote, Majorca/Mallorca, the Canary Islands and Menorca. Naturally it makes sense to enjoy the unique surroundings Spain offers and as such many people will have bought or have considered buying a boat. Boats don’t come cheap and so marine insurance is essential to protect yourself against the risks of boat ownership. About you: name, address, your sailing experience, any no claims bonus, whether you have had any previous claims. About your boat: vessel name, vessel flag, location of berth, value, make and model, hull, dimensions, build materials, engine (if applicable), fuel type, type of use i.e. pleasure/private use or business i.e. charter or rental and whether boat is to be taken out of Spanish waters. Morgan Marine are a company providing insurance for Jet Skis, Super Yachts, Catamarans, Charter Boats, Commercial Boats and Speed Boats. Yes and no – due to increases in the amount of accidents and injuries, especially involving jet skis, the government has introduced compulsory third-party liability insurance. The minimum amount this covers is approximately 325,000 Euros and it aims to cover personal injury claims. Currently you don’t have to take out comprehensive cover – in other words you sail your boat at your risk if you don’t insure it. You have to have the third-party liability but if your boat sinks then that is your loss should you choose to risk it. One of the most popular water-based vessels in Spain is the jet ski which many people have taken up for recreation. Although the jet ski does come under the category of marine and boat insurance we have received so many questions about jet-skis in Spain that we have created a special page just for jet ski insurance. The Spanish word for jet ski is Moto Acuática. A jet ski also often is described as a PWC (personal water craft). Yachtsman is an Irish Company with over 40 years’ experience as a marine insurance specialist providing security and peace of mind for the private boating sector.We pride ourselves on our excellent, friendly service and can tailor insurance policies to suit the individual insurance requirements of our clients. We insure all private boats from dinghies to mega yachts and cover can be arranged over the phone within minutes.